Columnist Mark Mathias shows how he makes the perfect waffle. When I travel, I like the hotels that include a self-serve breakfast. A few years ago, I stayed at a hotel that had a fairly simple machine that makes waffles. It’s a cast-iron clamshell device. You simply pour a measured amount of waffle batter onto the griddle, close the clamshell, rotate it 180 degrees and a timer is started. When the timer beeps in about 90 seconds, you rotate the clamshell 180 degrees, open it up and voila! — a perfect waffle. 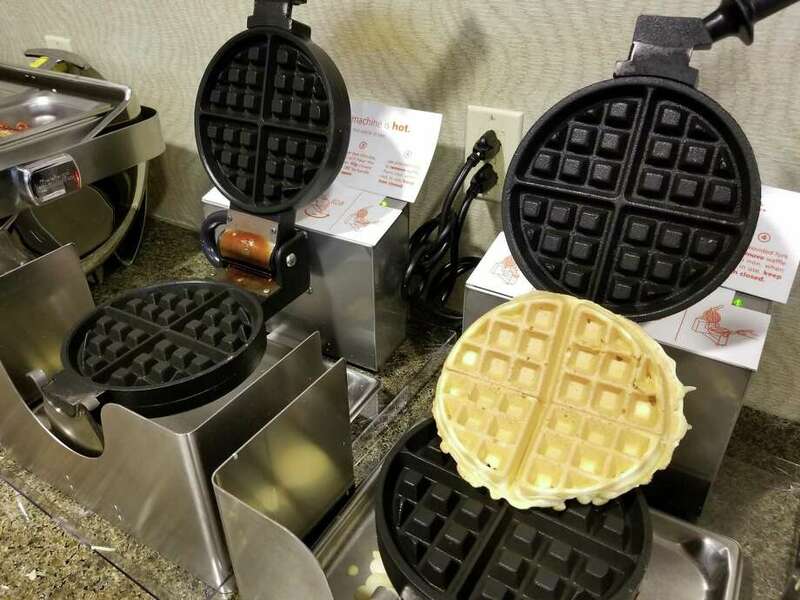 When I first saw this, I thought it was a great way for hotels to offer guests fresh cooked waffles. Better yet, it doesn’t require any hotel staff to make the waffles, other than to keep the supply of batter available. As I travel, I’ve seen these waffle machines pop up in hotels across the United States and Canada. What makes this the subject of a technology column is the fact that these waffle machines have become simpler and better to use over time. You used to have to spray the waffle iron every time you use it. If you didn’t (which many people didn’t), the waffle would stick to the iron and make it essentially unusable until someone (usually hotel staff) pulled out the waffle bits. Now, whether it’s a coating on the waffle iron or something in the waffle batter, the waffles release perfectly every time. I’ve recently seen the next natural extension to the waffle machine: the pancake machine. Simply push a button for one or two pancakes and in a couple of minutes, the requested number of pancakes pops out, nicely cooked and ready to eat. Neither of these machines is particularly complicated. Nor is either of them fast. After all, it does take a finite amount of time to cook something. But their ability to automate a straightforward task is noteworthy. Making them something that people of any age can use is also impressive. It’s good to see these devices taking their rightful place alongside the toasters, microwave ovens and other similar kitchen appliances that are appearing in hotel restaurants. They are not yet to the sophistication of the “Star Trek” replicators that would create a meal in a matter of seconds, but these devices certainly make creating your own breakfast a lot of fun.